The Hubble Space Telescope snapped this shot of the galaxy Holmberg II blowing huge bubbles of gas, which were created by supernova explosions. 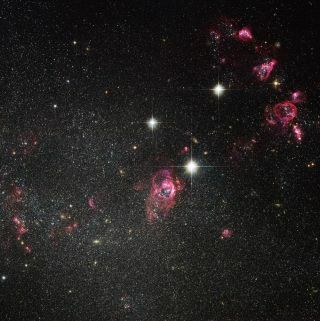 A stunning new photo from the Hubble Space Telescope catches an odd dwarf galaxy blowing huge bubbles of glowing gas. The galaxy is known as Holmberg II, which is located about 9.8 million light-years from Earth in the M81 galaxy group. The intricate bubbles of gas scattered throughout the galaxy are evidence of supernovas, powerful explosions that mark the death of massive stars, researchers said. Holmberg II isn't an elegant spiral or a well-defined ellipse. Instead, it's a dwarf galaxy with an irregular and unremarkable shape. The galaxy appears as a patchwork of dense star-forming regions and huge expanses of relatively barren areas with less material, researchers said. These broad stretches of mostly empty space are havens that allow the delicate bubbles to persist for long periods of time, researchers said. In areas with more mass, gravitational forces would tear such fragile structures apart. Holmberg II's odd appearance has earned it a place in Halton Arp's "Atlas of Peculiar Galaxies," which catalogs strange and interesting objects throughout the universe. And the galaxy has other intriguing characteristics. For example, Holmberg II also harbors a superluminous X-ray source, which is found in the middle of three gas bubbles at the top right of the new image. This powerful radiation stream may come from an intermediate-mass black hole, researchers said, through astronomers are still investigating the feature. The new photo is a composite of visible and near-infrared exposures taken using the Wide Field Channel of Hubble’s Advanced Camera for Surveys. The Hubble Space Telescope launched on April 24, 1990, aboard the space shuttle Discovery's STS-31 mission. The venerable instrument, which recently made its one millionth science observation, is a joint effort of NASA and the European Space Agency.